Many times rear-end accidents are referred to as a fender-bender accident. The term fender bender can negate the severity of the injuries that can result from this type of impact. As skilled Chicago personal injury lawyers we have handled many cases involving rear-end accidents. In many accidents, severe injuries can result from these rear end accidents, resulting in life-long injury or death. If you are driving or a passenger in a car that is hit from behind even at a very slow speed, your body can lunge forward quickly and cause catastrophic injuries. These injuries could be to the head, neck, shoulder and torso. At Nemeroff Law Offices, we have had years of success achieving large settlements and verdicts in the area of personal injury and car accidents. Contact an experienced Chicago car accident attorney at Nemeroff Law Offices for additional information about our car accident lawyers and personal injury attorneys. 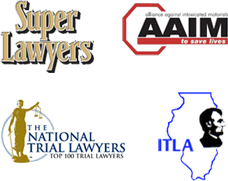 We offer a free consultation with a knowledgeable Chicago car accident lawyer from our firm. Weekend and evening appointments are available. If your injuries prevent you from traveling, we can come to your home or hospital. Never accept an insurance settlement without talking to an experienced car accident lawyer first. Insurance companies and their adjusters are masters at seeming kind on the telephone when they speak to a victim, making them feel like the insurance company cares and is going to be fair. That façade is a false front. That insurance adjuster's job is to make you feel secure while trying to pay you as little as possible or nothing on your serious injury case. While you are sitting back dealing with your serious injuries, the insurance company and their lawyers are working behind the scenes to gather evidence that will minimize your case. That is why hiring an experienced Chicago injury attorney is so important. You need lawyers on your side who are gathering evidence to make your case better while you deal with your injuries. In the majority of rear-end collisions, the driver in the rear is found to be at fault for the collision. If this is the case the driver's insurance company may act quickly to offer you a settlement. The settlement may appear to be a large sum of money. Many accident victims will be tempted to take the settlement and avoid contacting an attorney. If you accept the settlement, you will be forfeiting your right to seek future compensation. Many accidents victims don't do realize that their injuries can be more serious than they appear, requiring additional treatment or surgery. Take the time to meet with an experienced car accident attorney for a free consultation. They can explain the insurance claims process in Illinois. Also help you determine the value of the case. Passengers involved in a rear-end collision have the right to seek compensation for their injuries. A law suit can be filed even when the driver of their car is found at fault. In most accidents, the injured passengers know the driver personally. Therefore, there is often hesitation or reluctance to pursue a lawsuit against a friend or family member. Don't forget that what you are really doing is pursuing a claim against their insurance company, a company that collected premiums for years and now has to set forward and pay for the injuries caused by the negligence of their insured. An experienced Chicago injury lawyer will know the law and be able to apply the facts of your case successful to win the case for you, the injured victim. Talk to a lawyer at Nemeroff Law Offices to help you through this difficult event in your life.